Is the Next Alien Movie in Trouble? Is Laura Dern returning to Jurassic Park? Will Polaris finally state “Magneto was right!” in the series finale of The Gifted? What dark magic hath Paddington wrought in his movie sequel? Plus, images from Black Panther, an official title for Tremors 6 and more! That’s the signpost up ahead—your next stop, Morning Spoilers! AVP Galaxy has found someone who claims that Ridley Scott’s Alien: Covenant sequel, which will focus/would have focused primarily on Michael Fassbender’s android David instead of the titular xenomorphs, has been quietly canceled by Fox following lackluster response to the movie. The information comes from a Blu-Ray.com forum member named “HumanMedia,” who claims to have worked on Covenant, which means you should probably grabbing giant handfuls of salt and clutching them closely to your chest. The sequel to Covenant was originally due to start preproduction this month [September 2017] in Sydney. After the box office results filming was canceled, and a warehouse storage unit full of stuff was auctioned off a few months ago. So the original plan of pumping out another quickly has definitely changed with no immediate plans for anything. 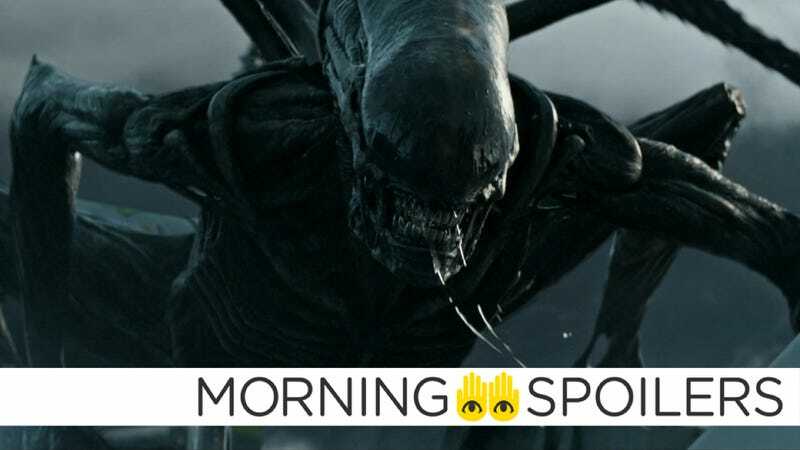 The next Alien film may have indeed been killed, but it seems just as likely that the project is being shelved so those involved can rework the story and script. The newsstand edition of the latest issue of Empire shows off Black Panther’s vibranium armor — now flecked with neon purple striping. It took me to a dark place. Honestly, I can’t really go through all I went through to get into it because I want to keep that close to me. But it stuck with me afterwards… Chadwick’s a very talented dude. There’s a lot of physical moments and action sequences throughout this film that cause us to really challenge ourselves, and also fall deeper into character. It’s an all-black cast for the most part and it’s set in Africa, but it’s universal in so many ways to everybody around the world, so I feel like it’s something that everybody can take something from. The same article also features two new images from the film. During the Los Angeles premiere of Downsizing, Laura Dern played coy when asked by Entertainment Tonight if she’d be making a cameo as Dr. Ellie Sattler. [It] could be fun. I mean, I love Ellie Sattler. She’s a tough feminist, come on! We need her back. Scarlett Johansson has wrapped filming. /Film reports the upcoming Tremors sequel set inside an Arctic research station is now officially titled Tremors: A Cold Day in Hell. An action-oriented domestic trailer for the Paddington sequel has also been released. During a recent TV Line Q&A, Emma Dumont stated Polaris will be “coming into her own” in January 15’s season finale. It’s funny, I’ve been having conversations with the writers and Matt Nix, our creator, about Lorna and that exact thing. She seems so strong and confident all the time — like, we only see very small moments of weakness from her — but what she’s coming into is maybe not her own, but her chosen path, the path she was born into, which is really interesting. Showrunner Jason Rothenberg has been leaking screenshots and behind-the-scenes photos from season five on his official Twitter page. Spoiler TV has images from the season finale of Van Helsing, “Black Days.” More at the link.